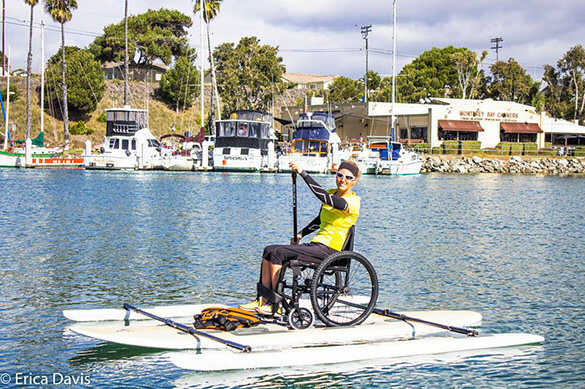 With a design reminiscent of the outrigger canoes of ancient Southeast Asian maritime cultures, a new-to-market product has merged old and new technology to provide people with disabilities access to the open water. It was just last year that avid surfer and Hawaiian native Kawika Watt and his partner, James Rouse, embarked on an exciting and fulfilling venture. Their goal: to empower people with disabilities to discover independence, freedom and enrichment through participation in water sports. 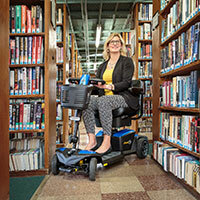 Their means to achieving it: Onit Ability Boards. 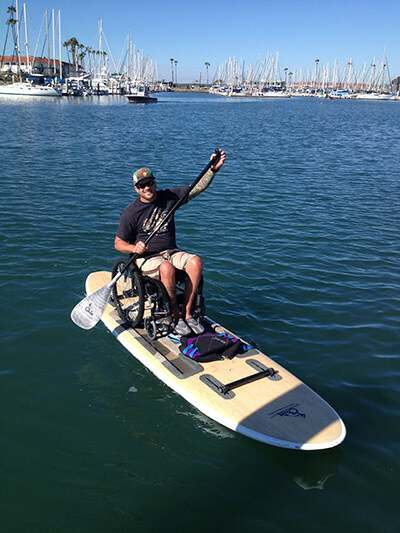 This unique adaptive paddle board system actually incorporates a meticulously crafted standup board, an all-terrain surf chair, a custom ramp which allows the wheelchair user to roll onto the board unaided, and a mechanism to lock it securely in place. Outriggers on either side lend stability as the rider skims across the water's surface. Advanced paddlers can remove these outriggers once they have mastered the balance. A dedicated surfer before his motorcycle accident 26-years-ago, Charles Webb was one of the first to utilize the Onit Ability Board following his brother's chance encounter with Watt. "Kawika believes in helping people," he told SUP Magazine. "We were two people praying for the same thing. I wanted something to get me back to a normal life and he wanted to help people with that. It was too surreal to be a coincidence." Paddling provides significant aerobic exercise, honing both physical skills and mental well-being. In Webb's experience, the benefits of a month and a half of thrice weekly training far exceeded the years spent in rehab. In addition to increased muscle strength, balance, mobility and circulation, paddlers find themselves with elevated confidence and reduced stress, body fat and dependence on pharmacological treatments. According to Shad Eischen, "The Onit System is great. It has brought back a sense of freedom and independence back to my life. It has allowed me to get out on the water and become one with nature. The rehab benefits of the system are the greatest part for me. It's a great workout system and has really strengthened my core." Whether your goals are competitive or rehabilitative, Onit Ability Boards allow you to do it all. Stop by their booth at Abilities Expo and see why, "You're on in because we are Onit!" For more information, visit www.onitabilityboards.org.